It was again difficult to select pictures to feature in this update's current Grand Marais scenes. Since I update the photo blog almost daily at www.agatelady.blogspot.com, there are a lot from which to choose. I decided to select pictures that capture the diversity of what you can see in the Grand Marais area if you are willing to get out and explore. We'll start out with some photos documenting the end of winter and beginning of spring. This is when the snow and ice begin to melt. Because sand is mixed in with the frozen precipitation, there are beautiful color schemes that develop during the melting phase. 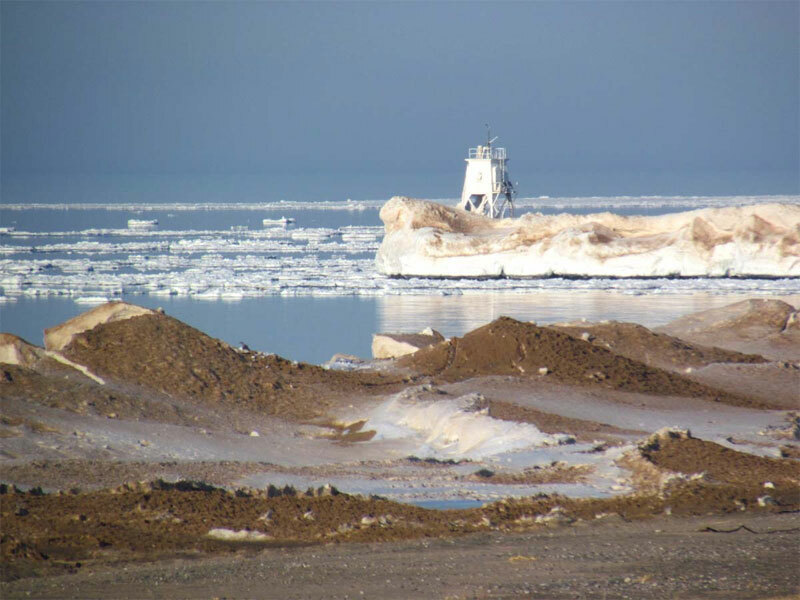 The first picture shows ice in the channel entering Grand Marais Bay. 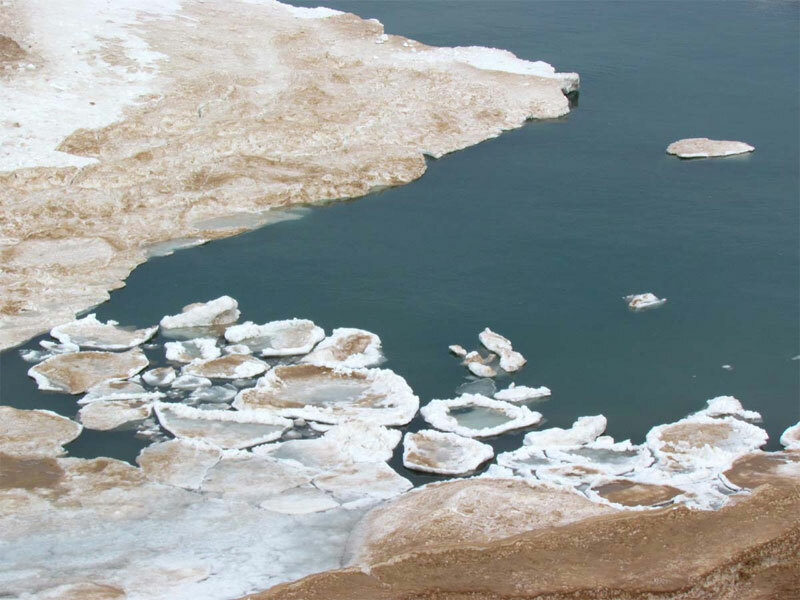 Shore ice hugging and extending from the beach is shown in the second photo. The tall structures in the third picture look like dunes, but they are actually 20-30 foot ice bergs anchored right off shore. A storm the next day after I took this picture in early April broke apart the ice. 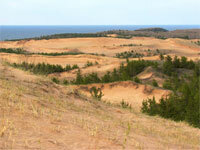 As many of you know, my favorite place to hike in the local area is the Grand Sable Dunes. 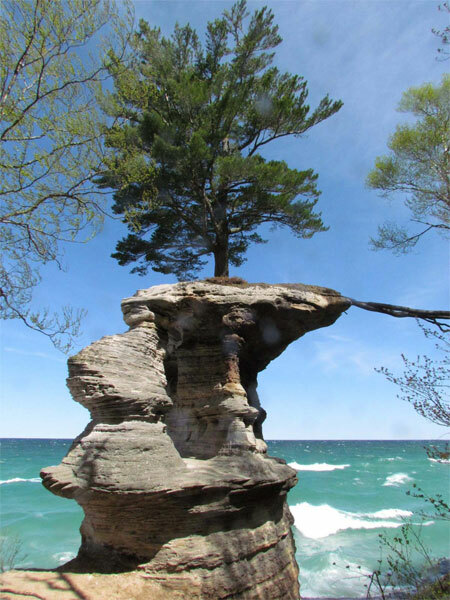 This fantastic geologic formation contains some the world's most pristine perched dunes. 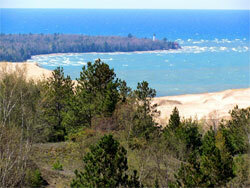 They cover a five mile stretch between the Sable River and Au Sable point. Glacial ice that melted within the Superior Basin around 10,000 years ago produced many large rivers. These rivers deposited millions of tons of debris into many different configurations south of the Superior Basin. 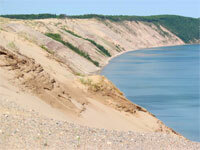 The Grand Sable Banks most likely originated along one of these glacial rivers. Between 4,000 and 6,000 years ago, the land mass that is now the Upper Peninsula started to rebound upward from the weight of the previous ice glacier. This is called isocratic rebound. The U.P. is still rebounding today. The land forming the lake's outlet at North Bay began to rise, which reduced the amount of outflow and caused water levels to rise rapidly. In fact, Lake Superior rose to about 40 feet higher than it is today! The rise in lake levels formed Lake Nipissing. Lake levels of Lake Nipissing also began to rise which caused the Grand Sable Banks to become unstable. The higher water eroded the bluffs which left them exposed to wind. 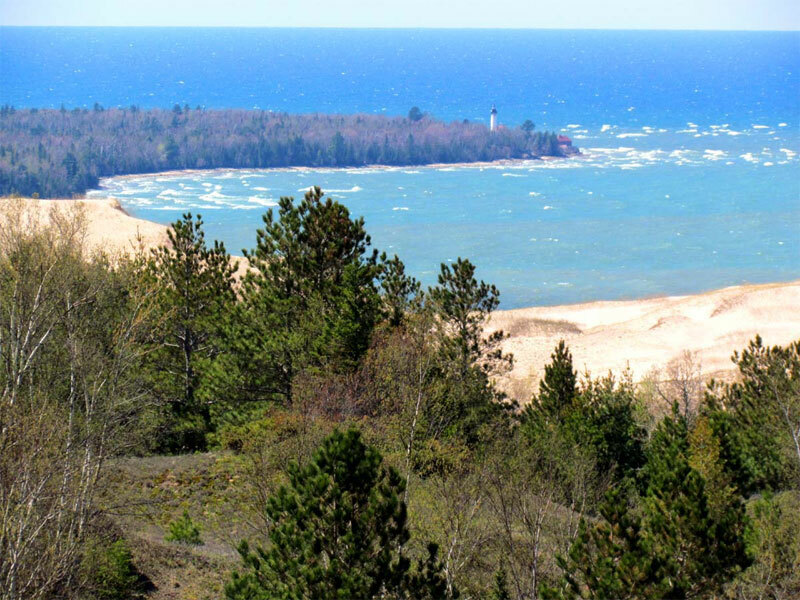 A dominant northwesterly wind blew through the Grand Sable Banks which carried the wind from the bluff to the top of the flat upland. This sand was "perched" on top of the upland, hence the name, "perched dune system." 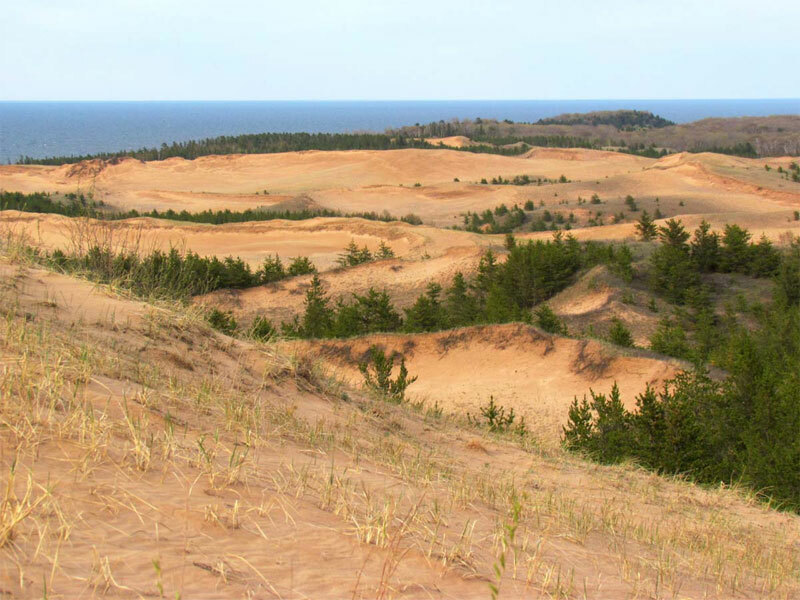 The climate of the Grand Sable Dunes is typical of any Michigan climate. The winters are fairly long and cold while the summers are short and cool. The location of the dunes happens to be the second most cloudy area of the United States. The average cloud cover is approximately 70%. Grand Marais' annual temperature is 40.8 degrees Fahrenheit with precipitation totaling 31 inches a year. During the winter season snowfall accumulation ranges from 130 to over 200 inches. 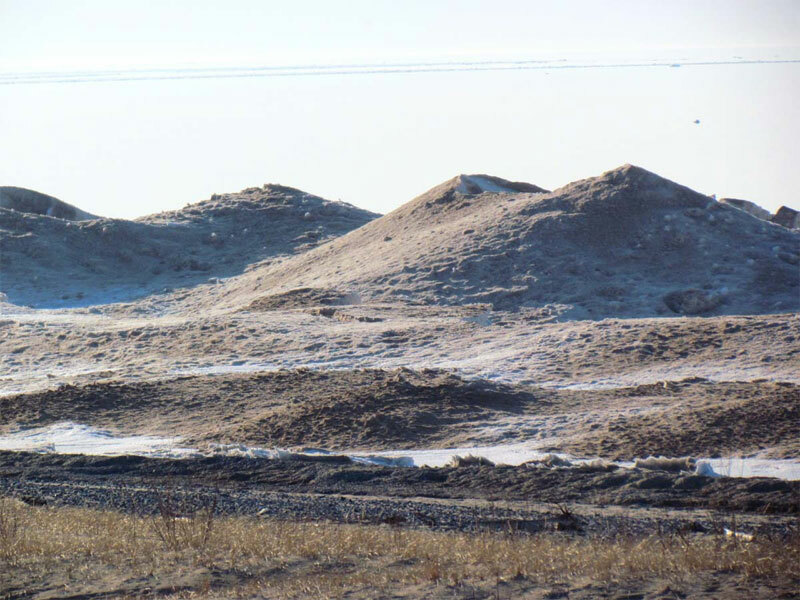 Because the dunes are so close to Lake Superior extreme low temperatures in the winter and extreme high temperatures in the summer do not occur. Seney, Mich., Nov. 21. -- Life savers reported today that a total of 12 bodies have been found on the south shore of Lake Superior during the 35 hours' search which followed the fearful gale that swept the lake Thursday. The four bodies found since the searchers previously reported were all of men. The two corpses of women have been unidentified. Among the wreckage cast ashore today were several life belts stenciled "Steamer Curtis." As no trace of the steamer C. F. Curtis was been obtained and as it is considered certain that one of her schooners, the Annie M. Peterson, sank near Grand Marais, local marine men believe the Curtis also went to the bottom. It is also claimed there were only seven persons on board the Peterson. 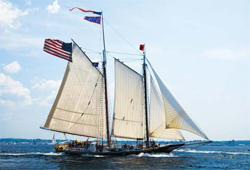 The Curtis was known to have been to wing the schooners Peterson and S. E. Marvin when the gale struck her. No wreckage of the Marvin has been found so far as searchers in this vicinity have been able to learn. Sault Ste. Marie, Mich., Nov. 21. -- Up to a late hour today, the last 24 hours had revealed little information to clear up the mystery surrounding the fate of the steamer C. F. Curtis and the lumber laden schooners S. E. Marvin and Annie M. Peterson in tow of the Curtis, which were caught Thursday in the season's most severe storm on Lake Superior. 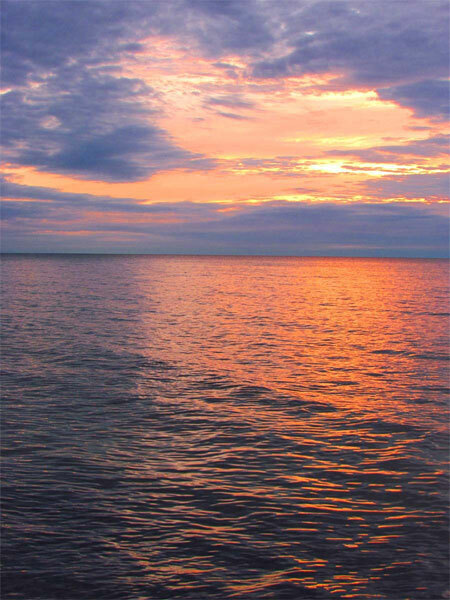 That the Peterson went down in "the grave yard of the Great Lakes" near Grand Marais, seems absolutely certain in view of her bodies and wreckage which have been washed ashore. Two of the eight bodies recovered last night were identified today as members of the Peterson's crew. Whether some of the other bodies were from the Curtis or Marvin remained to be determined after identification had been made. The three missing vessels carried 26 persons in their combined crews. The fact that two of the bodies recovered were those of unidentified women caused many to believe the Curtis met the same fate as the Peterson inasmuch as it was thought one or both of women had been employed on that vessel. 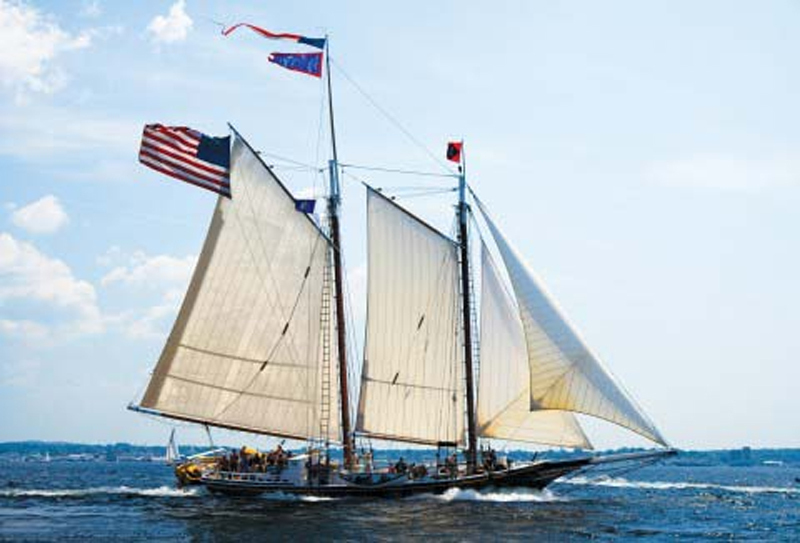 The sailing records did not reveal any women hands on the two schooners. 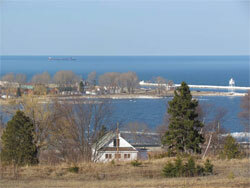 The three ships cleared from Baraga with lumber for North Tonawanda, N.Y. Wednesday morning. They should have passed this port long ago, but were not heard from until the Peterson wreckage was found yesterday. None of the several other steamers which went aground along the upper lakes during the gale was seriously damaged according to reports today. 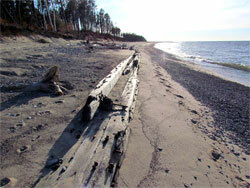 One of the best times to hike in Grand Marais is during the spring. Every day it seems like there is a new wild flower in bloom. 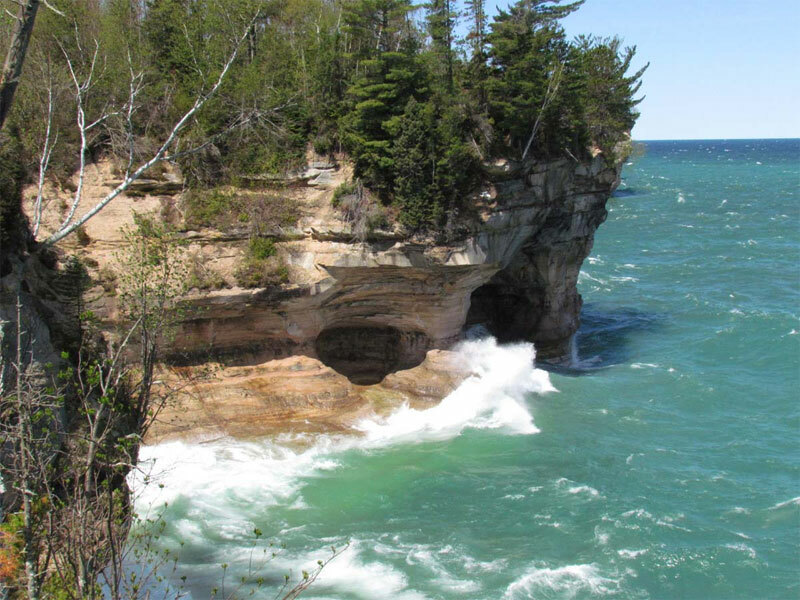 It is also a fun time to hike the Pictured Rocks lakeshore trail. 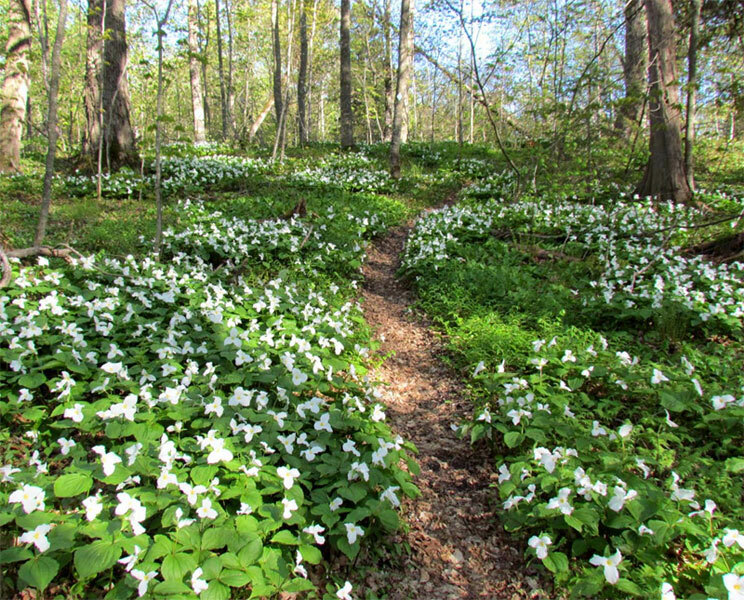 Below is a shot of a trillium-lined trail in the Park as well as a few taken on a hike in the Chapel Rock area. And finally one of the sunset pictures I've taken in the past few weeks. It is always exciting in Grand Marais the first time the sun sets east of Au Sable Point – at least from the vantage point of town.